Great technical match.Chono won by pinfall when he gave a kick to the head of Jericho. Morrus delivered a lot of radical moves like a moonsault,,bodyslamm on concrete. He tried a dive of a top rope outside the ring,but missed and Bubba got the win by CVountout. 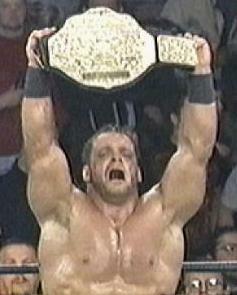 Bagwell gave Riggs a powerbomb, the n got th win with his Buff Blockbuster signature move. Page got the Diamond Cutter.He saw the NWO coming after he nailed it.So Page ran into the stands and Norton got the win by Countout. Patrix was knocked out.Anderson came in and did the pin count after the Steiners nailed there finisher the Frankensteiner.Two days later the decision was reversed and Outsidders got there belts back. Eddy nailed syxx with the belt,Climbed the ladder and got the belt.For the win. Hogan gave Giant a bodyslam. After that The Giant challenged the whole NWO to come out.When the giant was going to give Syxx a chokeslam. Hogan nailed the Giant with a guitar and got a pin. IN this triple tag team mexican match Juventud's team won when Chavo nailed a splash of the top rope pinning La Parka. Chris Jericho wins the title when he made Mysterio submit to the Lion Tamer. After the match Jericho thanked the fans. Ravens Flock interferes in the match and distracted Martel.Booker T got the win with the Harlem Hangover. Zybysko really sucked in this match. Hall came down ringside with Louie Spicolli him and Hall double-teamed on Larry. Dusty Rhodes came down beat up Louie,then KO'd Zybysko giving him the win by DQ. Scott Steiner started off and never made a tag.Scott gave a belly-to-belly suplex to Konnan got the win. Giant was about to give a chokeslam to Nash then got distracted by Hogan who splashed Hot Coffee in his face.Then Nash gave Giant a Jacknife and got the pin.Two Days later the Move was banned from WCW. A match which many WCW commentators considered a classic,I thought it wasn't that good when I saw it.The only good part was Flairs Figure 4 Leglock around the Ringpost.I fell asleep during this match.Oh,yeah Bret won the match with the sharpshooter. Another dull match with two wrrestlers with no ability.Luger won the match with the Torture Rack. Another WCW/NWO Brawl started after the match. Norman Smiley vs. Chavo Gurrerro Jr.
Ric Flair's son was making his wrestling debuting in this match. HE started it off and gave a couple moves to Windham in the first 2 minutes of the match. The rest of the match was Flair getting his but whooped with Windham giving him a superplex off the top Turnbuckle and Hennig giving him the Figure 4. Hennig was gonna give David the Fisherman Suplex until Arn Anderson nailed him with a wrench and David covered Hennig for the 3 at 13:20. 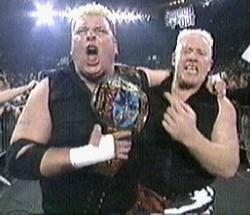 Right after the pind the NWO came and handcuffed Ric to the ropes and beat the crap out of David Flair. This is the second ladder match televised on WCW since the first Souled Out 2 years ago. Usually a ladder match has the belt hanging up in the air, but in this case it had a tazerstick and the first person to use it would win. Goldberg favored his left knee making out he injured it earlier that day. A cool moment was when Hall nailed an elbow off the ladder which made Goldberg bleed. Hall and Goldberg just about grabbed the tazer stick on several occasions. Goldberg was about to grab it until Disco Inferno came out and shoved him off the ladder and helped Hall climb it. Hall grabbed the stick, but missed it on Goldberg who dropkicked it out of his hands. Goldberg grabbed it and used it on Disco and Hall begged for him not to use it. Goldberg tossed the stick in the air, and as Hall reached for it Goldberg gave Hall the spear then the Jackhammer and used the stick on Hall for the win at 16:51. Right after that Bam Bam Bigelow came out and attacked Goldberg, Hall recovered and used the Tazer stick on Goldberg and Bigelow. It was mostly Flair & Crowbar double teaming on Vamprio for most of the match, but near the end of the match, Falir gets Vamp in the Figure 4, and Crowbar nails a splash off the TB on Vampiro and goes for the pin, but Flair shoves Crowbar off, and Flair and Corowbar argue and fight each, ewhile Vampiro sneaks up from behind and nails his finisher, the Nail in a Coffin(DVD) on David Flair for the pin. Before the match Oklahoma entertains the crowd by making fun of them. The match is rather short, Madusa gets a couple of dropkicks, misses one, and Oklahoma makes it into a DDT. Oklahoma gets tossed out of the ring where Nitro Girl, Spice and Asya attack Oklahoma, then toss him back in the ring, and out of nowhere Oklahoma rolls Madusa up for the 3 and WCW's booker becomes the new Cruiserweight. Lots of chair smashin hear folks. Knobbs bent a chair over Meng, and he just stood there during the match! Meng also just stands there after a Smiley nailed him with a trash can! Meng is about to pin Knobbs, but Finley pulls him off, and Smiley and Knobbs run the ropes, and Knobbs nails Smiley with a police shield, and and gets the pin to retain his belt. This is a bunkhouse brawl. They decide to brawl in there wrestling gear instead of street clothes. Both did lots of high-flyin moves like Kidman doing a flying legdrop and an elbow off the top TB by Saturn. Kidman takes a nasty fall when he was thrown outside the ring onto a table. Kidman responded to backbody dropping Saturn to the arena floor. Saturn then tries for a powerbomb, but Kidman reverses it into a Bulldog pinning combination for the 1-2-3! The match progresses pretty slow between the 2 brothers from Harlem who were the 10-time WCW tag team champs. Booker T connects with his Axe kick and out Ahmed Johnson to help beat on Booker T, to draw the DQ, out comes Midnight, but she doesn't help, Stevie Ray calls Ahmed, "Big T" and bills himself and Big T, the "New Harlem Heat." Abbot's brings down Flynn and starts punching him like mad, Flynn tries an armbreaker submission, but Abbot makes it into a powerslam on Flynn. Flynn kicks Abbot in the corner, then Abbot sidekicks Flynn in the back of the head and Flynn is out, and the match is over with Abbot the winner. Both men try to beat the crap out of each in order to get the win. Many 10-Counts are failed by each other(rules are similar to the Mankind/Rock match at Feb '99 PPV). Bagwell hits the Buff Blockbuster, but DDP gets up at 9. Kimberly comes out, and DDP nails Buff with an object, and leaves the arena with Kimberly, drawing a no contest to the match.